We’ve seen plenty of exciting stuff relating to X-Men: Days of Future Past, including Sentinels, casting that fuses all previous X-movies, and a very promising teaser scene tucked into the credits of The Wolverine, but director Bryan Singer officially notched up the excitement by teasing Apocalypse for the Days follow-up. Singer posted a simple tweet this week that read: “#Xmen #Apocalypse 2016.” There’s been no formal confirmation of an X-Men movie for 2016, but this seems to confirm it, or at least strongly suggest it. More importantly, Singer’s tweet reveals a plan to bring X-Men villain Apocalypse into the mix. This could involve drawing from any number of storylines in the comic books, but Marvel’s fan-favorite “Age of Apocalypse” arc is the one that ties most directly to Days of Future Past, which comes to big screens on May 23, 2014. It gets a little complicated, but the story arc kicks off when an alternate timeline is created as a result of the untimely death of Professor Charles Xavier at the hands of a time traveler (also Xavier’s son) gunning for the younger version of Magneto. This creates a new timeline in which Magneto embraces the ideals of his dead friend, bringing about a harmonious co-existence between humans and mutants. This catches the attention of Apocalypse, the 5,000-year-old “first” mutant, who launches a war against the planet Earth that eventually results in the conquering of North America and the establishment of mutants as a ruling class. Age of Apocalypse was a major crossover event that replaced the “regular” Marvel Universe timeline for the length of its run. The lengthy arc eventually comes to an end when Bishop (Omar Sy’s role in Days), the only mutant aware of the time-shift, travels to the past and prevents Xavier’s death. A movie built around the Age of Apocalypse arc would certainly fit with the past/present storylines that Days of Future Past jumps between, but it’s not the only possible route an Apocalypse-led story could take. The ancient mutant appears in quite a few X-Men plotlines. 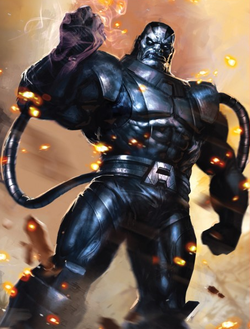 Age of Apocalypse seems the most likely source of inspiration for Singer though, given the crossover event’s popularity and the lineup of characters appearing in the 2014 film. There’s certainly a lot to think about here. How do you feel about the idea of an Age of Apocalypse-set movie?